Monday was a busy day for roster moves in the Phillies' organization. On top of the news that Mike Adams would return to the Phillies at the expense of Luis Garcia being sent down to Triple-A, there were several notable transactions announced throughout the system. Top catching prospect Cameron Rupp was placed on the disabled list with a strained oblique suffered in Sunday's game. The 25-year-old was batting .231 with four homers and eight RBI in nine games with the Triple-A IronPigs. Sebastian Valle was promoted to Lehigh Valley from Double-A Reading to fill the void. Other backstop moves: Chad Carman promoted to the Reading roster from Class A Advanced Clearwater, Deivi Grullon activated for Clearwater from extended spring training. Also placed on the disabled list with an oblique strain for Lehigh Valley was infielder Andres Blanco. The 30-year-old infielder was batting .273 with one RBI in nine contests in the young season. Reading outfielder Kelly Dugan, who was hit on the left hand with a pitch on Sunday, tweeted on Monday evening that X-rays were negative and he expects to be out of action for a week. The 23-year-old was hitting .233 with a home run and four RBI through 10 games. Outfielder Tyson Gillies was activated for the IronPigs on Monday, after going 2-for-8 in two games while rehabbing an ailing hamstring with the Class A Advanced Clearwater Threshers. The 25-year-old Canadian has been troubled by injuries since joining the Phillies from Seattle in the 2009 Cliff Lee trade. Righty reliever Mike Nesseth was moved from Lehigh Valley to Reading. Nesseth, who turns 26 later this month, tallied a 0-2 record with a 9.39 ERA in four outings (one start) with the IronPigs thus far this season. It was announced that the Phillies have released righty reliever Justin Friend. The 27-year-old had made three scoreless appearances this season (one for Lehigh Valley, two for Reading). Friend sported a 3.79 ERA in 46 games at the Triple-A level last year. In four contests as Reading's third baseman, 23-year-old Cesar Hernandez is batting .471 with an RBI and a stolen base. Comparatively, in 11 games at Lehigh Valley's third baseman, 21-year-old Maikel Franco has a .098 average witha double and two RBI. Class A Lakewood right-hander Tyler Viza is one of the youngest pitchers in the South Atlantic League. 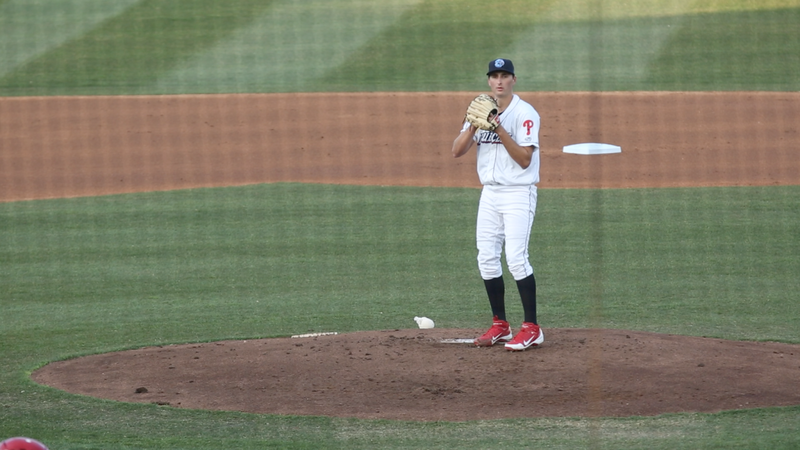 Drafted out of Desert Vista High School in the 32nd round of last year's draft, the 19-year-old has allowed seven runs in 10 innings (6.30 ERA) while losing both of his starts for the BlueClaws. "You know, everybody threw real well in spring training and, fortunately, I got to come here and I had a good spring training, but I'm looking for a better season." "It's tough to say. I'm happy where I'm at. I'd be happy anywhere I go. You know, I gotta take things one step at a time. Can't look too much into the future, if I'm here all season, I am..."
"It's still baseball to me. You know, I'm going to keep staying on my game, pounding the zone, attacking hitters and everything. Not surprised. It's still baseball. There's a little more competition and everything." "Growing up, I was a Randy Johnson fan. He played for the Diamondbacks and I'm from Arizona. Lived there my whole life. He has the same kind of mindset that I like to have, just don't really care who's in the box. Just going after them and getting outs." "I try not to think about it. If it comes, it comes. I know that I'm real young, I have time to grow and I'm looking forward to what the future has for me."